Disney Research has teamed up with Swiss math, technology and engineering university, ETH Zurich, to release the VertiGo, a small robotic car that can drive up vertical surfaces. Disney has been making quite a bit of news lately, acquiring Marvel properties as well as “Star Wars.” Now they are shocking the world once again by producing a small robotic vehicle that is not from a “galaxy far, far away,” but can climb walls just like Spider-Man. This robot, dubbed the VertiGo, does not utilize radioactive spider powers, repulsor lift technology, or the force to defy gravity. Instead, it is driven by two propellers that sit atop its body. When diving forward, the propellers tilt backwards and push the small vehicle along. 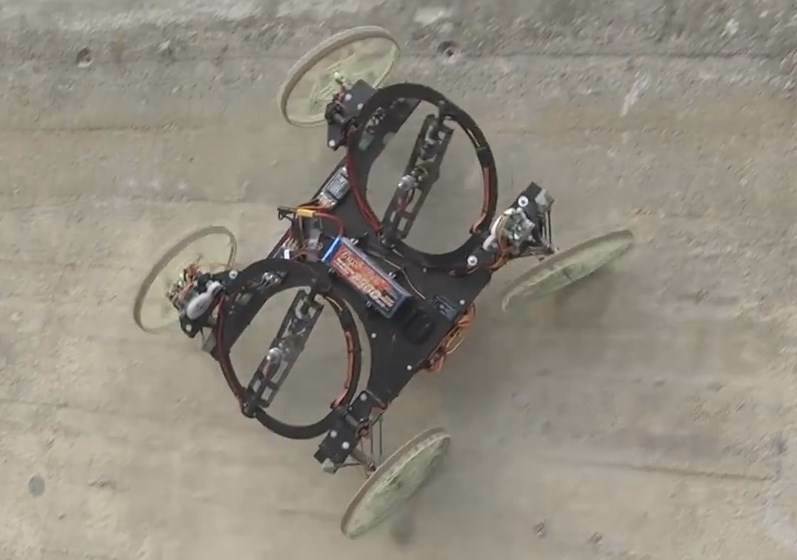 In order to scale walls, the propellers tilt away from the vertical surface and push the robot against the wall with such force that it stays pressed against the wall. The VertiGo can be controlled like an RC car using a remote control device, but it also features two infrared sensors to navigate around obstacles automatically. To further augment its agility, the robot’s body is constructed of lightweight carbon fiber. The vehicle also uses 3D-printed parts that are durable without weighing the craft down. It is not yet known what the utility of the VertiGo will be. Will Disney slap Mickey Mouse stickers on it and market it during the 2016 Holiday season? Will it be used as a prop in the next “Star Wars” movie? Does the device have applications in space exploration? Watch the VertiGo in action in the video below.